Netherlands-based international beer company Heineken is globally airing a series of advertisements — “There’s more behind the star”— starring actor Benicio Del Toro. 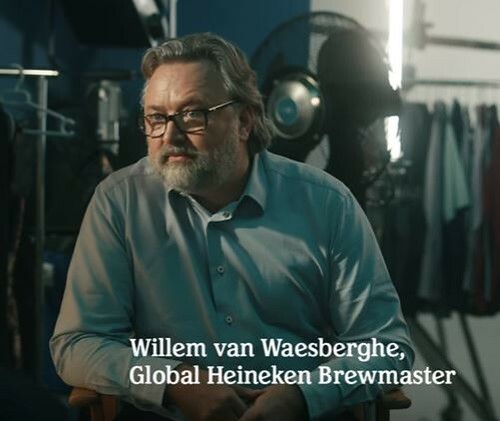 Because, in one of the series, Mr. Del Toro, incredulous about the simplicity of Heineken's recipe for its beer, quizzes Heineken's brewmaster, Willem van Waesberghe, and because of how Mr. Waesberghe —definitely a macro-brewery tribune— answers the question ... even if his response is scripted. An original recipe brewed from only three all-natural ingredients. Only three ingredients? Come on; that's a typo. No, it's not a typo. Just water, barley, and hops. Come on, Willie. Water doesn't count as an ingredient. Water is water. No, no. Ninety-three percent of beer is water, so you'd better make it as pure as possible. How about you throw in a dash of, uh, lemon zest. Anything else is a condiment. Read more about the "There’s more behind the star" campaign: at Brewbound. See "Just Water, Barley, and Hops": at YouTube. See more of the ads: at YouTube. YFGF doesn't watch many Heineken commercials as a matter of course, so a thank you is due to Dan Fox, a past beer ad-man, who wrote about this campaign at his blog, Hey Beer Dan. * 23 April, 2016, marked the 500th anniversary of the Reinheitsgebot, the German beer 'purity law, still in force, modified, today. In all our towns, marketplaces and the whole of the countryside, beer shall have no other ingredients than barley, hops, and water. Wilhelm IV, Duke of Bavaria, who knew about yeast, did not include yeast as an ingredient of beer in his decree of 1516. Beer writer, Jeff Alworth, explains why: at All About Beer. And I have to echo the sentiment of Ron Pattinson--the Reinheitsgebot is a load of nonsense (http://www.europeanbeerguide.net/reinheit.htm) and its widespread adoption in Germany homogenized a wild and varied beer scene. Death to the Reinheitsgebot, I say! Let's bring back the Goses and Grodziskies and Broyhens rather than the interchangable Pilsners and pale lagers.